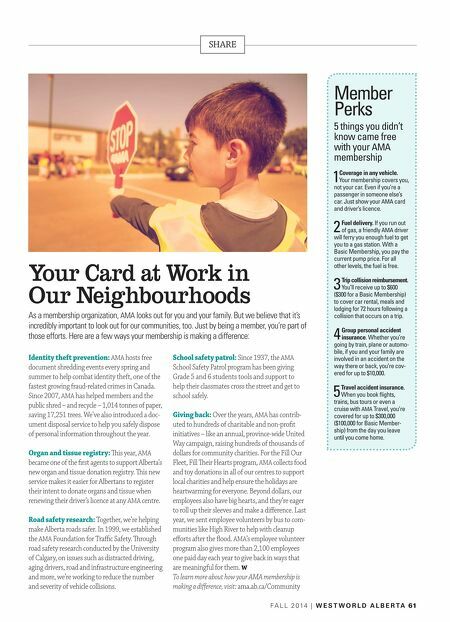 f a l l 2 0 1 4 | w e s t w o r l d A l b e r t A 61 share Your Card at Work in Our Neighbourhoods As a membership organization, AMA looks out for you and your family. But we believe that it's incredibly important to look out for our communities, too. Just by being a member, you're part of those efforts. Here are a few ways your membership is making a difference: Identity theft prevention: AMA hosts free document shredding events every spring and summer to help combat identity theft, one of the fastest growing fraud-related crimes in Canada. Since 2007, AMA has helped members and the public shred – and recycle – 1,014 tonnes of paper, saving 17,251 trees. We've also introduced a doc- ument disposal service to help you safely dispose of personal information throughout the year. Organ and tissue registry: is year, AMA became one of the first agents to support Alberta's new organ and tissue donation registry. is new service makes it easier for Albertans to register their intent to donate organs and tissue when renewing their driver's licence at any AMA centre. Road safety research: Together, we're helping make Alberta roads safer. In 1999, we established the AMA Foundation for Traffic Safety. rough road safety research conducted by the University of Calgary, on issues such as distracted driving, aging drivers, road and infrastructure engineering and more, we're working to reduce the number and severity of vehicle collisions. School safety patrol: Since 1937, the AMA School Safety Patrol program has been giving Grade 5 and 6 students tools and support to help their classmates cross the street and get to school safely. 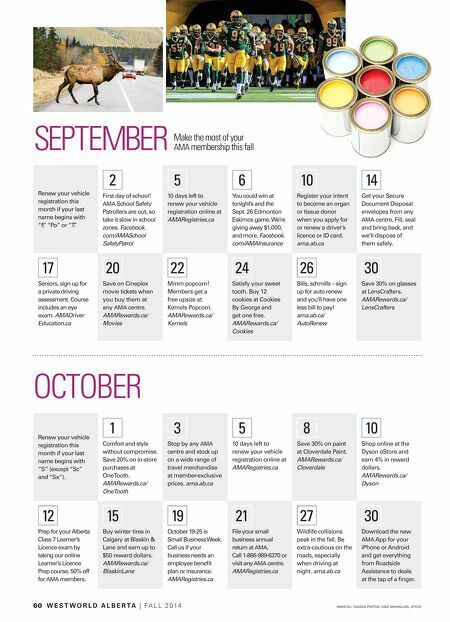 Giving back: Over the years, AMA has contrib- uted to hundreds of charitable and non-profit initiatives – like an annual, province-wide United Way campaign, raising hundreds of thousands of dollars for community charities. For the Fill Our Fleet, Fill eir Hearts program, AMA collects food and toy donations in all of our centres to support local charities and help ensure the holidays are heartwarming for everyone. Beyond dollars, our employees also have big hearts, and they're eager to roll up their sleeves and make a difference. Last year, we sent employee volunteers by bus to com- munities like High River to help with cleanup efforts after the flood. AMA's employee volunteer program also gives more than 2,100 employees one paid day each year to give back in ways that are meaningful for them. W To learn more about how your AMA membership is making a difference, visit: ama.ab.ca/Community Member Perks 5 things you didn't know came free with your AMA membership 1 Coverage in any vehicle. Your membership covers you, not your car. Even if you're a passenger in someone else's car. Just show your AMA card and driver's licence. 2 Fuel delivery. If you run out of gas, a friendly AMA driver will ferry you enough fuel to get you to a gas station. With a Basic Membership, you pay the current pump price. For all other levels, the fuel is free. 3 trip collision reimbursement. You'll receive up to $600 ($300 for a Basic Membership) to cover car rental, meals and lodging for 72 hours following a collision that occurs on a trip. 4 group personal accident insurance. Whether you're going by train, plane or automo- bile, if you and your family are involved in an accident on the way there or back, you're cov- ered for up to $10,000. 5 travel accident insurance. When you book flights, trains, bus tours or even a cruise with AMA Travel, you're covered for up to $300,000 ($100,000 for Basic Member- ship) from the day you leave until you come home.